Small, mountainous, and completely landlocked by South Africa, about three-fourths of Lesotho’s population live in rural areas and engage in subsistence agriculture. Lesotho produces less than 20% of the nation's demand for food. Rain-fed agriculture is vulnerable to weather and climate variability; an estimated 725,500 people will require food assistance in 2012/13. The distribution of income in Lesotho remains inequitable. 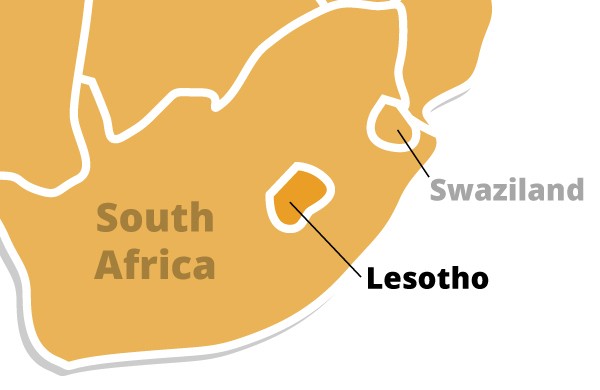 Lesotho relies on South Africa for much of its economic activity. Rural areas in South Africa and Lesotho are marked by poverty and inadequate access to health care. Diarrheal diseases and malnutrition sometimes occur. Malaria is also found in the low-lying regions of the Northern Province. However, people with access to land and employment enjoy a reasonable standard of living. Lesotho's capital city, Maseru, is a growing city with modern hotels and fine restaurants. Common forms of transportation include buses, trains, and taxis.